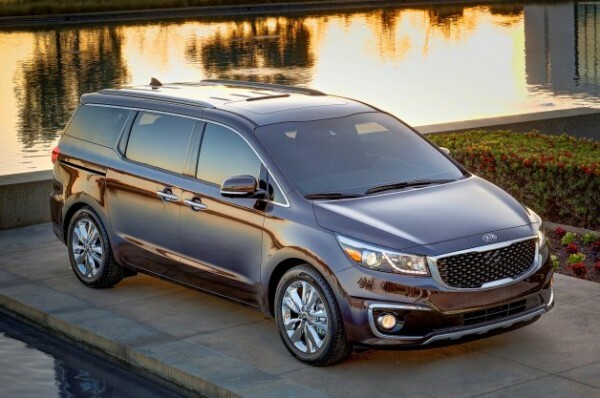 The All New 2015 Kia Sedona Revealed – The Bunch Blog! The 2015 Sedona can be configured to seat either seven or eight occupants, and its size specifications put it right at or near the top of its class in most categories, including leg room. Kia says this is the final piece of the styling puzzle that started when design director Peter Schreyer took the helm of the Korean company’s studio. We certainly see some masculine cues, especially with its high belt line and relatively small windows. We think the end result is pretty attractive though it falls clearly in minivan territory, you’re welcome to draw your own conclusions after scrolling through the image gallery above. Kia promises the new Sedona will provide “an element of desire” with “improved driving dynamics” to go along with all that room inside. To that end, the new Sedona’s chassis is reportedly 36-percent stiffer than the best of its competition, due to a body shell crafted from 76-percent high-strength steel. Kia expects a five-star safety rating from the National Highway Traffic Safety Administration, though the van has yet to be crash tested. We’ll have to wait a bit before we can test Kia’s claims of driving enjoyment, which is often lacking in the minivan segment, but we’re at least sure to enjoy the Sedona’s 3.3-liter V6 and its 276 horsepower and 248 pound-feet of torque, routed through a six-speed automatic transmission to the front wheels. Again, those specifications are right in line with class leaders. Kia’s latest UVO technology will be included, which will come with a new Kia App Store that we look forward to hearing more about, and there are extras for both the Apple and Google ecosystems. A cooled glove box is helpful in this segment, as are USB ports for charging and household-style outlets. We’re also pleased that Kia has fitted the minivan with a Surround View Monitor to help parking and maneuvering in tight spaces.